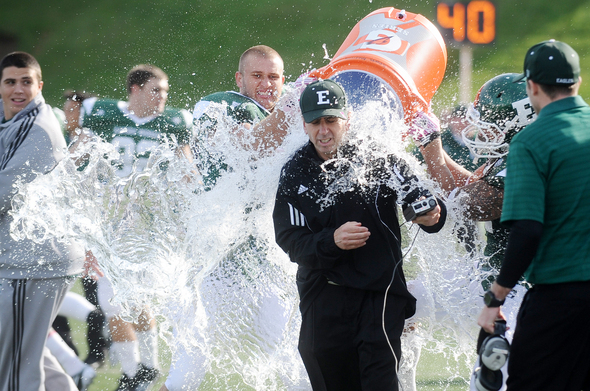 Posted on Sat, Oct 22, 2011 : 4:24 p.m.
Eastern Michigan defensive coordinator Phil Snow reacts to a water bath as the Eagles celebrate a 14-10 win over Western Michigan Saturday at Rynearson Stadium. After two official reviews, it’s conclusive. This Eastern Michigan football team is for real. A goal-line stand with five minutes remaining put an exclamation point on a strong defensive performance by the Eagles in their 14-10 homecoming win over Western Michigan in front of an announced crowd of 6,772 at Rynearson Stadium on Saturday. Two plays on the series were reviewed by the replay official, who twice determined Eastern Michigan (5-3, 3-1 MAC) had, indeed, stopped the Broncos (4-4, 2-2) short of the goal line. On the first, defensive back Latarrius Thomas stopped Western Michigan’s Chris Prom inches from paydirt on a third-and-goal pass from Alex Carder that started at the 3-yard-line. On fourth down, Broncos running back Tevin Drake was stopped short by a group of Eagles. Eastern Michigan turned to its successful running game from there, running out the clock with eight straight runs -- the biggest being a 14-yard gain by quarterback Alex Gillett on a third-and-11 play with 1:56 remaining. Junior running back Dominique Sherrer returned from a five-game absence due to injury to lead the Eagles with 86 rushing yards on 11 carries, but it was sophomore Javonti Greene that had the days’ two biggest plays. Greene scored on a 50-yard pass from Gillett early in the second quarter -- the only points of the first half -- and broke off a 50-yard, game-winning run midway through the fourth quarter. Drake's 46-yard run in the opening minutes of the second half tied the game at 7-7 and and John Potter's 37-yard field goal early in the fourth gave the Broncos a 10-7 lead. Greene (13 carries) finished with 61 yards while Gillett (15 carries) and Dominique White (six carries) added 30 yards apiece. Gillett was an efficient 6-of-9 passing for 144 yards. Carder completed 24-of-34 passes for 181 yards, including seven for 70 yards to his favorite target, Jordan White. Carder was sacked twice and hurried six more times and the Broncos converted on just 3 of 13 third-down plays. The win gave Eastern Michigan possession of the Michigan MAC Trophy for beating Western Michigan and Central Michigan in the same season. The Eagles scored in the final minute last week at Central Michigan to win 35-28. Sun, Oct 23, 2011 : 2:28 a.m. It's nice to see EMU having success in football finally. They could probably get the bid for the Little Cesars Pizza Bowl if they keep this up. Sun, Oct 23, 2011 : 12:30 a.m.
Great job Eagles! Very impressive... I think I'm gonna buy me a ticket! Sat, Oct 22, 2011 : 11:19 p.m.
Fun game, Eagles! I enjoyed Bronco Busting in Ypsilanti!! Thanks for another fun game, Eagles. It's wonderful to see positive things happening to a good guy...way to go Mr English! You have worked hard for this! Sat, Oct 22, 2011 : 9:20 p.m.
For real in the MAC, at least. This is a much better team than anything EMU has had in a long time. Good job, Ron English. WMU is not for real. First trip to the area, they accept the first mercy-rule football game in Michigan history. Second time in, they lose to last year's 119th-ranked team. Sun, Oct 23, 2011 : 12:04 a.m.
Let's see....potshots at EMU, potshots at WMU, potshots at the MAC.....way to cheer a winning local team. Good grief. Sat, Oct 22, 2011 : 9:30 p.m.
Wrong by almost 110 years. Stanford surrendered during the third quarter in the first Rose Bowl game. There may have been other games that ended early before that one. Congratulations to EMU and Coach English for the 2011 Michigan MAC title. Hopefully this is a step to bigger and better things in the future!